dying from nine major diseases, according to new research. and diabetes, scientists have found. Yet, regularly eating white meat may reverse the damage, the researchers added. diseases than those who rarely eat white meat. various diseases than those who consume the least. the risk of dying from cancer or heart disease. both processed and unprocessed red meat. added to meat during the curing process. whole grains may protect against gout, they found. 50 to 71 for 16 years. consumed, including processed and unprocessed red and white meat, as well as their fish intake. 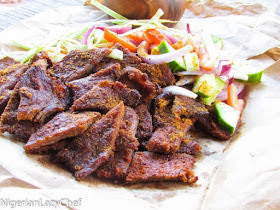 0 Response to "‘Eating Suya Increases Risk Of Death From cancer, Heart Disease,Stroke’ – Researchers"